Magnetic sphincter augmentation with the LINX® Reflux Management System is a novel device made of an expansible bracelet of magnetic beads designed to be placed around the gastroesophageal junction with a standardized laparoscopic procedure. This device can augment the function of the lower esophageal sphincter by preventing premature opening of the sphincter, thereby preventing reflux of gastric contents into the lower esophagus, while maintaining the ability to permit the passage of the food bolus and to belch and vomit. Magnetic sphincter augmentation has demonstrated in multiple studies consistent improvements in patient symptoms as measured by the GERD-HRQL instrument, freedom from PPIs, and improving objective pH control. These outcomes confirm that MSA is an effective method of controlling troublesome GERD symptoms. Future studies are required to determine its role outside of the initial indications for its use. Lundell L, Miettinen P, Myrvold HE, Hatlebakk JG, Wallin L, Engström C, et al. Comparison of outcomes twelve years after antireflux surgery or omeprazole maintenance therapy for reflux esophagitis. Clin Gastroenterol Hepatol [Internet]. 2009;7(12):1292–8. Available from: https://doi.org/10.1016/j.cgh.2009.05.021. Bonavina L, Saino G, Bona D, Sironi A, Lazzari V. One hundred consecutive patients treated with magnetic sphincter augmentation for gastroesophageal reflux disease: 6 years of clinical experience from a single center. J Am Coll Surg [Internet]. 2013;217(4):577–85. 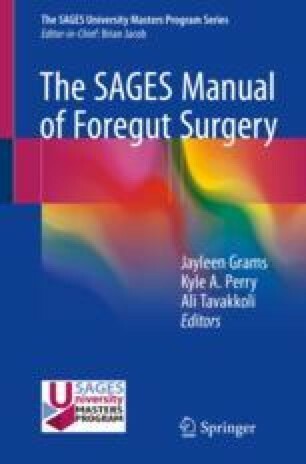 Available from: https://doi.org/10.1016/j.jamcollsurg.2013.04.039. Bauer M, Meining A, Kranzfelder M, Jell A, Schirren R, Wilhelm D, et al. Endoluminal perforation of a magnetic antireflux device. Surg Endosc Other Interv Tech [Internet]. 2015;29(12):3806–10. Available from: https://doi.org/10.1007/s00464-015-4145-6. Ganz RA, Edmundowicz SA, Taiganides PA, Lipham JC, Smith CD, DeVault KR, et al. Long-term outcomes of patients receiving a magnetic sphincter augmentation device for gastroesophageal reflux. Clin Gastroenterol Hepatol [Internet]. 2016;14(5):671–7. Available from: https://doi.org/10.1016/j.cgh.2015.05.028. Reynolds JL, Zehetner J, Wu P, Shah S, Bildzukewicz N, Lipham JC. Laparoscopic magnetic sphincter augmentation vs laparoscopic nissen fundoplication: a matched-pair analysis of 100 patients. J Am Coll Surg [Internet]. 2015;221(1):123–8. Available from: https://doi.org/10.1016/j.jamcollsurg.2015.02.025.